Take a break this holiday with SMUCKERS! I get it. The shopping, the lights, the lists, the pictures, the presents, the Christmas cards, the events, the parties, the stress and pressure to do everything and experience everything is INTENSE. It’s a crazy time full of exciting and fun things to do, but I think those things can cloud the true reason for the season. I personally am a serious list maker and I tend to keep going and going and going until it’s done. Especially when I’m checking off all my baked goods I need to make in the kitchen and wrapping all the presents. And when that list becomes daunting I usually like to put my head down and just get stuff done, like NO KIDS IN THE KITCHEN, I GOT STUFF TO DO! BUT WHAT IS THE FUN IN THAT!?! So, here’s the challenge for you mom’s out there. LET YOUR FUN SIDE SHOW DURING THE HOLIDAYS! 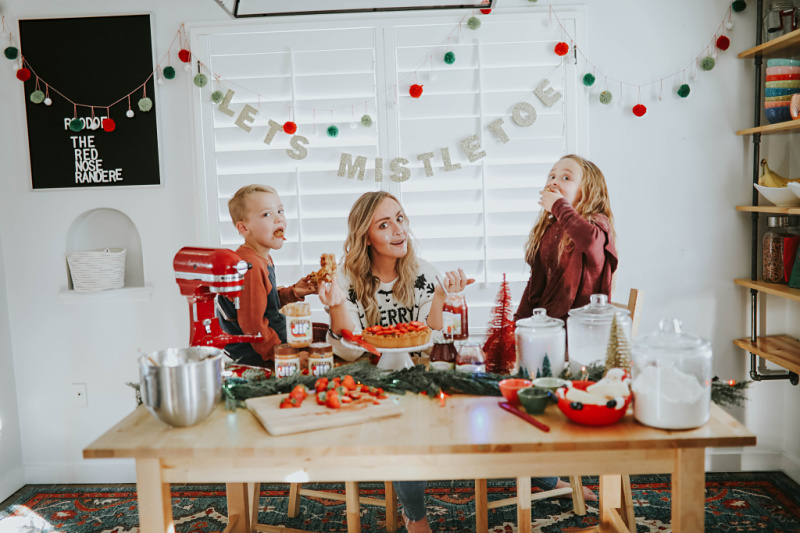 Come up with a fun and easy recipe to make with your kids to release the stress and just have fun! …with the one and only fresh-roasted peanut taste of Jif Natural and a touch of sweetness from Smucker’s Natural Strawberry Fruit Spread. 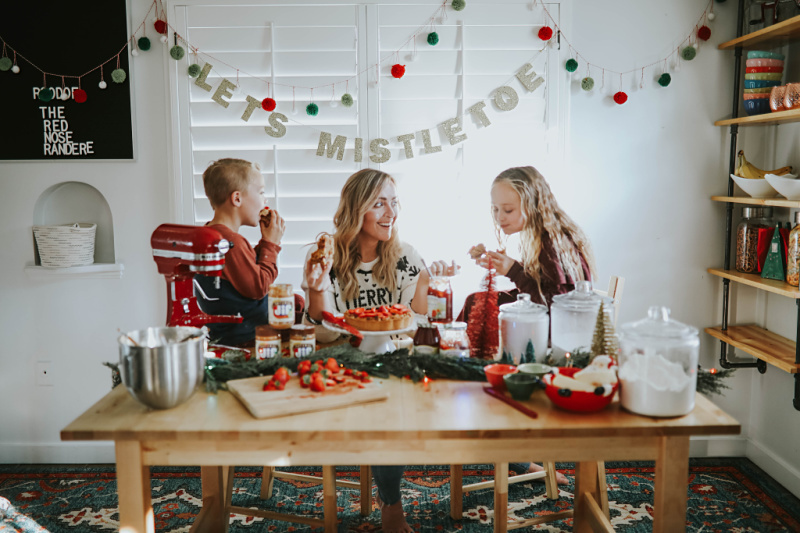 Spread a little love and joy this holiday season with the nostalgic taste of Jif & Smucker’s that everyone enjoys, INCLUDING YOUR KIDS! Don’t complicate connection, fun, and holiday cheer! Especially with your kids. This fun and easy recipe will be sure to ease your stress and allow you to be present, even if it’s just for an afternoon. Preheat the oven to 350°. Grease a 9” fluted tart pan with a removable bottom. Whisk the flour, baking powder, and salt in a medium bowl. Set aside. Cream peanut butter and butter with both sugars using a mixer. Beat in egg and vanilla. Add flour mixture and stir with a wooden spoon until combined. Press half the dough in the prepared tart pan. Spread with the jam, leaving a ½ inch border around the edge. Drop about half the remaining dough around the top of the jam, and press the remaining half around the border to seal the edges. Bake until golden, 45-50 minutes. Cool completely before removing ring and cutting. DON’T FORGET TO THROW SOME FLOUR AROUND! REMEMBER! The holidays don’t last forever, and neither do your young kids! Just enjoy it! « 20 ways to FIGHT depression and anxiety during the wintertime!